After using my Singer quilting machine for some time, I realized that it had its limits as far as sewing together a quilt of any size. During 2012, a few months before the point in the novel, The Fourteenth Quilt, when Lynn joined her two friends with their Christmas quilt project, I decided to purchase a larger machine, what I call a mid-arm. It had a larger throat that would allow me to work on larger quilts. You can see in this photo in which I put my regular size Singer behind my larger, mid-arm Brother, the difference in the work area between the motor casing and the arm. Regular size sewing machine behind the new Brother. My original intent was to just buy the machine and use it on the tabletop. 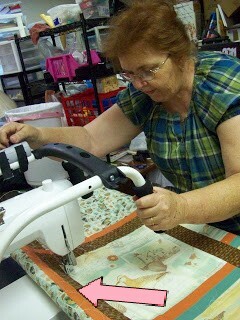 Many quilters use that method to quilt large pieces. However, as soon as I discovered I could also get a metal frame on sale the right size to go with the Brother, I decided to purchase it. In the novel I describe Lynn's sewing room as one of the bedrooms in the house. In real life I use a former construction office that I have turned into a studio aka junk room. I don't think it has been as neat as it shows in this picture before or since. This picture was taken the night my Brother got "framed." 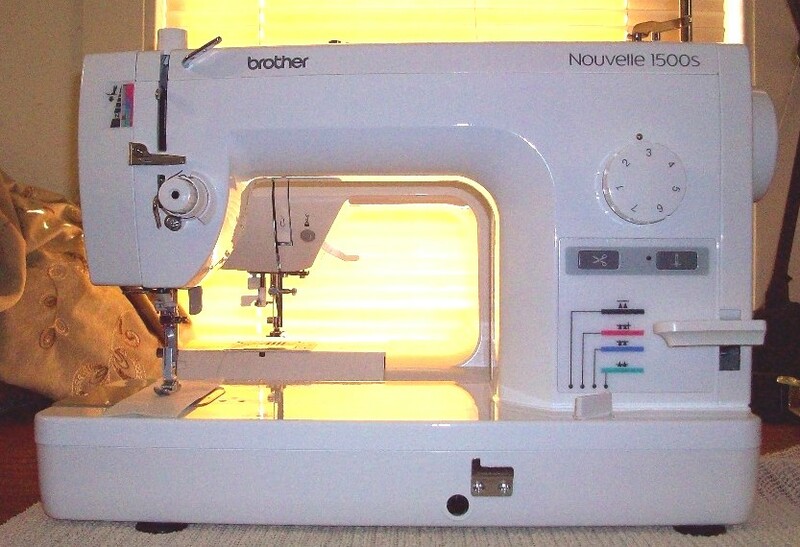 As I said when I originally posted a comment about this sewing machine, yes, that is me gritting my teeth. In real life I did quilt the kitten quilt as my first machine quilted project and it went pretty much as I described it in the novel. I didn't figure out the problem with the position of the uptake pole until I finished this particular project. This quilt I made for my union's political action committee suffered from some of the same difficulties as the kitten quilt. 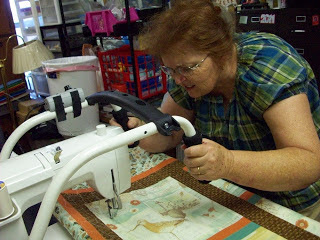 In the second picture of me working on this quilt you can see how the quilt goes up and over the uptake pole. 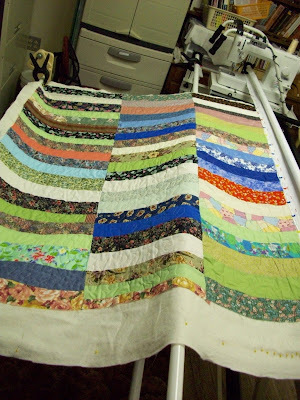 Here is another one of "Annie's" quilts in the making that ended up being given away for Christmas. You can see on the right side of the photo how I pinned the quilt to the cloth leader. 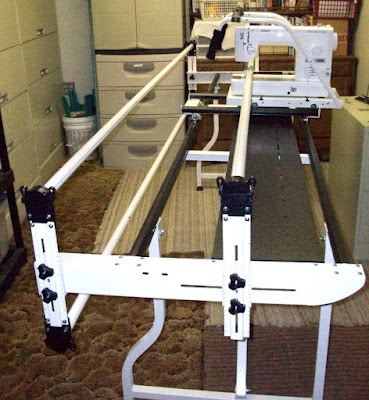 Also, by this point hubby and I had switched the pole so the quilt rolled UNDER and over, keeping it flat while it slid over the bed of the sewing machine. Oh, and the kitten quilt? Just like in the novel, in spite of my difficulties quilting it together, it was sold for $40. To learn more about the author, visit her writing blog, Robyn Echols Books by clicking HERE. Robyn, I am totally enjoying your book, The Fourteenth Quilt. Can't wait to read how it all ends.